All in one local service provider UrbanClap raised $50 Million from series D fund rounding. The funding round led by the new investor Hongkong based Steadview Capital, and existing investor Vy Capital also participated in this round. The fund used to expand its business in various aspects like technology, team building, and customer service. It is planning to expand its marketing and operations services in the country. With the raised funding the valuation of the company reached $480 Million. 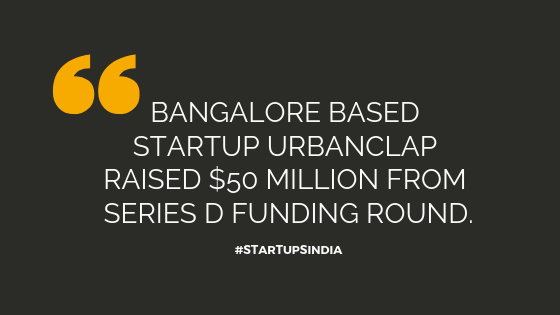 UrbanClap founded in the year 2014, which is based out in Bangalore. The founders of the company are Abhiraj Bhal, Varun Khaitan, and Raghav Chandra. Abhiraj Bhal is the current CEO of the company. It is all in one service provider for all your local needs & services in the affordable price range. It is offering 73 live services in various cities in the country, served 3 million customers till the starting of the company, and 1 Lakh experts available in UrbanClap. The startup is offering its services in 16 cities in India and recently started its operations in Mumbai. Before this funding, the startup raised around $49.1 Million from various investors. Steadview Capital is a HongKong based asset management firm which is encouraging and investing in various industries across the globe.